The domain within your query sequence starts at position 17 and ends at position 83; the E-value for the E2F_TDP domain shown below is 3.56e-31. This family contains the transcription factor E2F and its dimerization partners TDP1 and TDP2, which stimulate E2F-dependent transcription. E2F binds to DNA as a homodimer or as a heterodimer in association with TDP1/2, the heterodimer having increased binding efficiency. 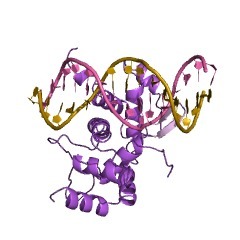 The crystal structure of an E2F4-DP2-DNA complex shows that the DNA-binding domains of the E2F and DP proteins both have a fold related to the winged-helix DNA-binding motif. Recognition of the central c/gGCGCg/c sequence of the consensus DNA-binding site is symmetric, and amino acids that contact these bases are conserved among all known E2F and DP proteins. This entry represents the DNA-binding domain of the E2F and DP proteins, which have a fold related to the winged-helix DNA-binding motif [(PUBMED:10090723)]. The mammalian transcription factor E2F plays an important role in regulating the expression of genes that are required for passage through the cell cycle. Multiple E2F family members have been identified that bind to DNA as heterodimers, interacting with proteins known as DP - the dimerisation partners [(PUBMED:7739537)]. There are 7934 E2F_TDP domains in 6713 proteins in SMART's nrdb database. Taxonomic distribution of proteins containing E2F_TDP domain. This tree includes only several representative species. The complete taxonomic breakdown of all proteins with E2F_TDP domain is also avaliable. Click on the protein counts, or double click on taxonomic names to display all proteins containing E2F_TDP domain in the selected taxonomic class. Structural basis of DNA recognition by the heterodimeric cell cycle transcriptionfactor E2F-DP. The E2F and DP protein families form heterodimeric transcription factors thatplay a central role in the expression of cell cycle-regulated genes. The crystal structure of an E2F4-DP2-DNA complex shows that the DNA-binding domains of theE2F and DP proteins both have a fold related to the winged-helix DNA-bindingmotif. Recognition of the central c/gGCGCg/c sequence of the consensusDNA-binding site is symmetric, and amino acids that contact these bases areconserved among all known E2F and DP proteins. The asymmetry in the extendedbinding site TTTc/gGCGCc/g is associated with an amino-terminal extension ofE2F4, in which an arginine binds in the minor groove near the TTT stretch. Thisarginine is invariant among E2Fs but not present in DPs. E2F4 and DP2 interactthrough an extensive protein-protein interface, and structural features of thisinterface suggest it contributes to the preference for heterodimers overhomodimers in DNA binding. In vivo association of E2F and DP family proteins. The mammalian transcription factor E2F plays an important role in regulating the expression of genes that are required for passage through the cell cycle. Thistranscriptional activity is inhibited by association with the retinoblastomatumor suppressor protein (pRB) or its relatives p107 and p103. The first cDNAfrom the E2F family to be cloned was designated E2F-1, and multiple E2F familymembers have now been identified. 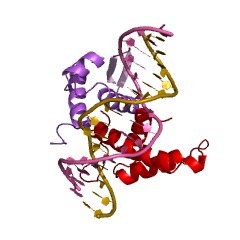 They bind to DNA as heterodimers, interactingwith proteins known as DP. Here we demonstrate that DP is also a family ofpolypeptides with at least two members (hDP-1 and hDP-2). Both hDP-1 and hDP-2bind to all E2F family members in vivo, and each complex is capable of activatingtranscription. However, the various E2F/DP complexes display strong differencesin the ability to bind to either pRB or p107 in vivo, and the specificity of pRB or p107 binding is mediated by the E2F subunit.